Admittedly, most tagging is nothing more than vandalism and generally just makes me angry. It is nothing more eloquent than visually peeing on someone else's property like a dog on a fire hydrant. 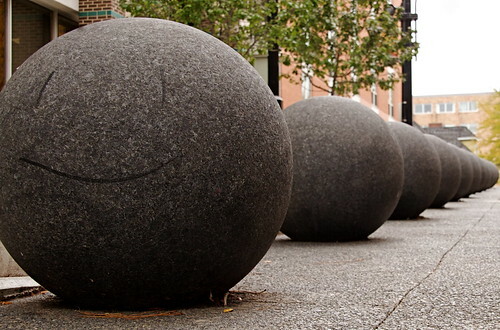 That said, I smiled when I noticed that some tagger had turned the first of this sculptural series of balls into the iconic "Smiley Face" popularized in the early 1970's. What can I say? I am a happy guy.